WHAT IS THE NOISE-REDUCTION IN dBUD’S TWO VOLUME SETTINGS? All the above measures are based on verifications by two independent acoustic labs, using the memory foam eartips. NRR AND SNR? WHAT DOES THE DIFFERENT ATTENUATION VALUES MEAN? NRR – Noise Reduction Rating – as per the US standard. SNR – Single Number Rating – as per the EU standard. The difference between the SNR and NRR is because of two different calculations of the variations in a broad population. Meaning, since people have differently shaped ear-canals, or they insert and use the earplugs differently – the protection can be higher or lower. The NRR includes a larger variance factor and is always lower than both the SNR and the averaged values. IS dBUD’S NOISE-REDUCTION LEGALLY CERTIFIED? dBud’s noise-reduction is certified with EPA and CE marking, tested and verified according to both the U.S. standard ANSI S3.19-1974 and the EU standard EN 352-2:2002. Two independent and accredited acoustic labs have tested and verified dBud’s performance. In the US, dBud has been tested and verified by Michael & Associates Inc.
– An acoustic laboratory accredited by NIST – National Institute of Standards and Technology. – Recommended by EPA – Environmental Protection Agency, the authority of enforcing the regulation about noise labelling in the US. In Europe, test results from any acoustic lab must pass a conformity assessment by a Notified Body, accredited by the European Commission. Only then can the earplug be legally CE marked. dBud has been verified by a Notified Body during the entire process from beginning to end – from the tests to the conformity assessment. WHEN AND WHERE CAN I USE dBUD? Anywhere with really loud sound, or lower background noise! dBud is designed to reduce harmful noise levels down to safe levels, and at the same time have a minimal impact on the sound experience. And with the volume slider, you can easily switch between two levels of noise-reduction without having to take the plugs out of your ears. MUSIC events: For DJs, musicians and party animals at concerts, festivals, dancefloors. SPORT events: At football stadiums and motor sports venues. MANUFACTURING, PRODUCTION & CONSTRUCTION: Hearing protection while clearly hearing what is going on around you: Alarms, communicating with staff, awareness of vehicles and equipment. CHILD CARE & SCHOOLS: Hearing protection and still easy communication with children, parents and colleagues. HOW QUIET DOES IT GET WITH dBUD, FOR INSTANCE IN A CAFÉ OR IN THE OFFICE? How much you’ll hear from your surroundings is of course dependent on the kind of noise that you are in. It’s probably good to know that the average human speech is 60-75 db, and the noise levels in for instance cafés is often around 80 dB. That would obviously mean that no earplug with avg 30 dB noise reduction will block out ALL that noise – but it can be enough for you to turn down background noise enough to a comfortable level for calm and concentration. Or just to rest your ears from the noise that we are exposed to daily. Read more about daily recommended limits for decibel exposure from the Center for Disease Control and Prevent. Also, keep in mind that dBud is not designed for complete silence and isolation. Instead, dBud is made to turn down the volume, while keeping as much of the sound quality as possible. Meaning, an attenuation that ensures that harmful loud noises are reduced to safe levels, with minimal distortion to the sound curve. HOW DO I INSERT MY dBUDS CORRECTLY AND COMFORTABLY IN MY EARS? dBud is not designed to reach very far into the ear-canal – and with the correct choice of size of eartips, dBud will seal sufficiently, without having to be pushed in too far. Just push the eartip slightly into the ear, while you make a twisting movement of the plug. If you are using the memory foam eartips; squeeze and compress them before inserting them, and they will then expand to the shape of the inside of your ears. The two outer circles on the neck of the plug enables two different positions of the eartip, so that you can make small adjustments to how far into the ear you want the eartip to go. Do not push the eartip fully down to the most inner circle that is closest to the plug body, because then the end of the neck is close to sticking out from the eartip, which is probably not very comfortable for you. The eartip should fully cover and cushion the hard plastic neck. Squeeze the foam tips before insertion. Then gently push the plug to the entrance of the ear-canal, while at the same time twisting the plug slightly. The foam tips expand after insertion in the ear and provide a slightly better seal and attenuation than the silicone tips. HOW DO I SAFELY REMOVE THE EARTIPS FROM THE PLUG? The ear-tips are long-lasting and of the highest industry standard. Please take some extra care when you remove the tips from the plug. 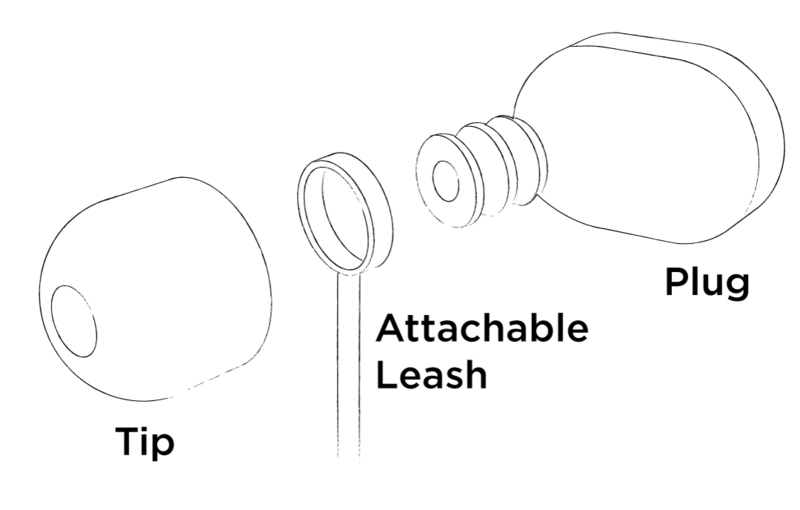 There are three small circles on the neck of the plug that securely position the eartips and the leash. Therefore, do not pull the eartips straight off the plug, because then they risk breaking. Grip the eartip with three fingers. Slowly pull and TWIST the eartip off the plug. This applies to both the silicone tips and the foam tips, but it is even more important for the foam tips, because of the little inner tube that can release from the foam if pulled too hard, and without the twisting movement. IS dBUD AVAILABLE IN DIFFERENT SIZES? 6 pairs of silicone and memory foam eartips are always included in the dBud kit, so that you can find a comfortable size and fit for you. S 10 mm, M 12 mm, L 14 mm. S 9 mm, M 10.5 mm, L 13 mm. CAN I EXCHANGE THE EARTIPS IF I NEED NEW ONES? Yes, you can order new foam eartips in our webshop from June 2018 and onwards. It is also possible to put on any 5,5 mm inner-diameter eartips of your choice. That could be pretty convenient, but we still encourage you to use the original type from dBud, to ensure the certified attenuation. Always keep your dBuds in the little carrying case (and not loose in your bag or your pockets) – to protect the eartips from unnecessary friction and damage. HOW DO I CLEAN MY dBUDS? We recommend that you remove the silicone or foam tips to clean them. You can safely clean the eartips in water under a tap or with a q-tip. The earplug itself should be cleaned using a damp cloth. If you see the need to clean the inside of the sound canal, be careful not to insert anything more than 5mm inside the canal, or you may damage the acoustic filter. It’s no panic if dBud gets wet, since there is no electronics inside. But the acoustic filter contains several meshes and small air channels, so we don’t recommend to submerge dBud in water for cleaning. If water gets trapped inside it will take time for your dBuds to dry out completely, and this may affect the performance. After cleaning, let everything dry on a towel before placing them in the storage case.